The Cimarron Starlite Cruisers' Car Club is a local group of car enthusiasts which enjoy the hobby of building, driving and showing classic cars and trucks. The Cimarron Starlite Cruisers' Car Club promotes the family activity and hobby of Classic Car and Truck Ownership and promotes interest and appreciation of classic cars and trucks. 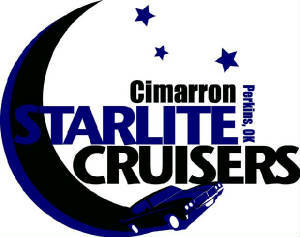 "Cimarron Starlite Cruisers Car Club"